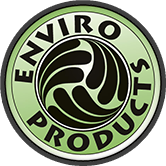 Thanks to Enviro products we got to review some of their great products! All of us here at my house try and drink lots of water so we are excited to use the stainless steel water bottles. We also got to review a lunchopolis lunch box and it is perfect for my son to take his lunch in it for school! Their stainless food container, and bamboo bag they have are great too! Thanks Enviro for the great products! Who is New Wave Enviro? New Wave Enviro was established in 1994 with a focus on providing pure, on-demand water at a reasonable price. New Wave Enviro believed in chlorine-free living and litter-free living long before the current media and consumer trends. 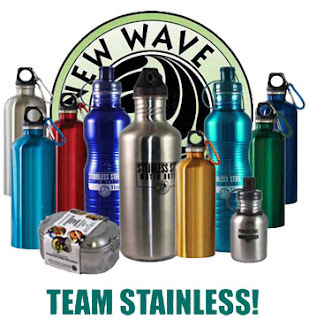 New Wave Enviro manufactures and distributes eco friendly products such as reusable water bottles and water filtration systems which produce high quality, inexpensive purified water from your own Tap. Every New Wave Enviro product emphasizes Green Living. Green Living is not complete without an on demand source of purified water. We manufacture drinking water filters, shower filters, bathtub filters and “on the go” filters for our corn-based reusable water bottle. All of our filters offer on demand “ all you want anytime you want it purified water”. As a compliment to our filtration products, we manufacture a complete line of reusable water bottles: Stainless Steel, EastarTM Resin, and Corn Resin. Sizes range from 8 oz to 5 gallon. How does New Wave Enviro promote Green Living? New Wave Enviro focuses on critical health and environmental issues facing us today. Plastic litter is filling up America’s landfills at an alarming rate. Most plastic drinking water bottles are designed for one time use and then thrown away. Every cheap plastic bottle produced uses up precious oil which is non renewable. New Wave addresses this issue by producing only eco friendly, reusable and recyclable water bottles. Our products include bottles made from EastarTM Resin, Stainless Steel, and our Corn-Based Bottle. Living a Plastic litter-free lifestyle is an easy, inexpensive and helpful step towards saving the environment. Chlorine gas was used extensively in WW1 as a chemical warfare agent. Today it is used in municipal water supplies to deliver water to our homes free of microscopic contaminants. However it serves no useful purpose on or in our bodies. New Wave designs, patents and manufactures water filters that remove harmful chlorine & other contaminants from shower, bath and drinking water at home and away from home. 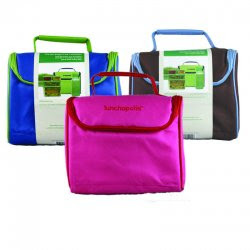 Thanks to Enviro I get to give away one lunchopolis lunch box, bamboo bag, stainless steel bottle, and a stainless food container! This giveaway ends on Tues. Oct. 6th, 2009. Cool, add me in on this one! I would love some fun products to help with my daughter's lunches. Holy smokes! 675 followers! You go girl!!! I am soooo excited about this one! Thanks so much for the chance! Great giveaway! On October 6 is my birthday and I want this gift. I really need a new lunchbox for my son! We would use theses at my house for sure! These prizes look amazing! I would love to be entered in your draw. Thanks. I'm always trying to figure out ways to be better to my environment. Re-usable lunch containers is a great idea! totally awesome - love the stainless! fantastic giveaway! I love most anything that is good for the environment. Thanks for the opportunity to win such a wonderful product. Gladly would I give up a plastic bottle for such a cute reusable. What a great way to save money on plastic bags! 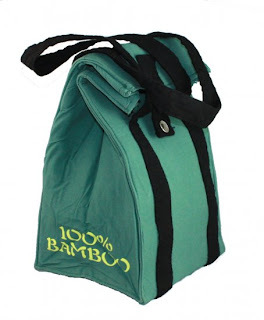 The bamboo bag is really cool! i love that lunch box! Wow these are great products! What excellent eco-friendly products. 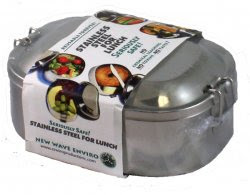 The stainless steel lunch box is really unique. Cool! These would be great for hubby taking lunch to work! What a great giveaway! I could use it to take my lunch to work! Please enter me!